Create this DIY Swarovski Crystal Necklace Design with Instructions, that Incorporates the New Crystal Innovations. Celebrate a sun-kissed summer with boho jewelry. This necklace is made using shell-like Mother of Pearl with Sea Snail Pendants and Jelly Fish Fancy Stones from Swarovski. Make and wear it with a sparkling megawatt smile! There are step by step instructions after the picture instructions. STEP 1: Insert a 4mm jump ring and Swarovski Pendant art. 6731 14mm Crystal AB onto a 6mm jump ring. Repeat this process six more times, but on the last one just use the 6mm jump ring. STEP 2: Cut 14 6cm long pieces of wire and make a loop at one end to form eye pins. STEP 3: Insert Swarovski Fancy Stones art. 4195 Crystal F 14mm and 22mm into the Swarovski setting. Gently close prongs using tweezers. Thread the Swarovski Fancy Stones onto a head pin and form a loop at the other end. Cut off excess wire. Repeat this step four more times, but thread the last one onto an eye pin as shown in our illustrations with this step. STEP 4: Insert the disk pendant and the 4mm jump ring including Swarovski Pendant into the loop of one of the eye pins made in step 2. Thread 4 Swarovski Bead art. 5000 3mm Crystal AB onto the eye pin and then add the shell pendant. Make a loop at the top of the shell pendant as shown. STEP 5: Attach another eye pin and Swarovski Pendant onto the loop make at the top of the shell pendant in the previous step. Insert 4 more Swarovski Beads and the disk pendants. Repeat this step one more time – see illustrations for clarification. STEP 6: Insert the Swarovski Fancy Stone art. 4195 14mm into the top most loop of the piece from step 5. Repeat steps 4-6 three more times to get three more similar pieces but of different structure. See illustrations for clarification. STEP 7: Cut a 10cm long chain and a 42cm long cord. Glue the cord ends into the cord endings. Attach one of them to a spring ring and the second one to a 7mm jump ring. STEP 8: Attach all the four pieces from steps 4-6 to the chain leaving a spare of 4cm to act as an extension. Attach the last Swarovski Pendant to the last link of this extension. 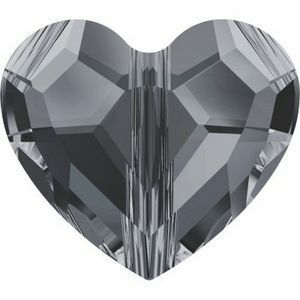 Have fun making this beautiful Swarovski Crystal jewelry design! 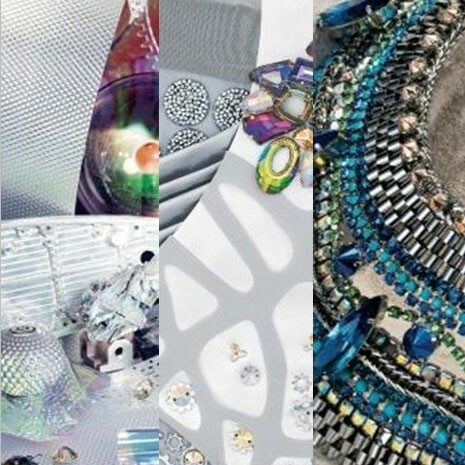 This Fall and Winter’s New Swarovski Innovations reveal a desire to connect with something very unique and nonconforming. The overall trend is to embrace innovative ideas, to branch out and discover new design ideas, textures and colors inspired by your own special gift for creativity! The idea is to harness your emotional connectivity to the world around you and introduce the unexpected. Classic color combinations, such as grey and neutral tones can be infused with splashes of vibrant colors, such as pinks, blues or purple tones to revitalize them with a spark of dynamic energy. There are four new Swarovski themes and corresponding crystal innovations for this Fall and Winter season and I will focus on the Classic Theme today. A new freedom from strict precision can be seen in enthusiastic splashes of vibrant color and combinations of diverse materials such as lace, faux leathers, satins and recycled textiles, that look even more extravagant when pared with crystals. This Swarovski crystal necklace “Dipped in Lace” design, bestows a whimsical and day-dreamy expression with cheerful and vivacious combinations of frothy white lace, Crystal Beads, Pearls and Pendants. This design includes instructions on how to create this eclectic assortment of textures and colors, one whose romantic and playful design is a creative inspiration! This colorful and eclectic “Sparkling Frida” necklace is a throwback to the signature style of the famous Mexican artist, Frida Kahlo. This energetic necklace is spirited and multi-dimensional, incorporating mixed metals such as chains, Crystal Double-Spike Beads, Pearls, BeCharmed Beads and Flatbacks, which all come together in one gypsy-like design that inspires us to go wild! This Fall and Winter 2014-15 Jewelry trends are influenced by an Eighties theme with quirky, versatile and streamlined shapes highlighted by shimmering metallics. With its one or two hole option, the new Pavé Thread Ring bead adds everyday opulence and creative versatility to all types of designs. Swarovski Crystal Fine Mesh is an exciting new product that made its debut on the Atelier Versace Fall/Winter 2014 Haute Couture catwalk in Paris. As an evolution of the original Crystal Mesh launched by Swarovski in 1993, it uses brilliant small XILION chatons to create the perfect gently flowing material for all-over second-skin shine, sparkling evening-wear and high-glamour looks. These pictures are courtesy of Versace. Please contact me for Crystal Fine Mesh ordering details. One of the most exciting, fun and rewarding things to do is to embark on a journey of new discovery and creativity through design. This season focuses on self expression and embracing new perspectives. Feel free to explore new ideas, push boundaries and make your design dreams come true! I hope these jewelry designs and trend ideas have inspired your creativity!